You are here: Home / Recipes / Sausage, Mash and Wine! Oddbins have been doing a very interesting promotion. They’ve put together a group of 6 wine writers and asked them to create a mixed case of Oddbins wines. Now, while I am no expert, I generally select the wines that I put in a case myself. Why? Well because I like the process of choosing what I drink. This case is a bit different though, I know three of the wine writers and when one of them, Miss Bouquet, contacted me and asked if I was interested in tasting her choice and coming up with a recipe for each of her two bottles, I jumped at the chance. 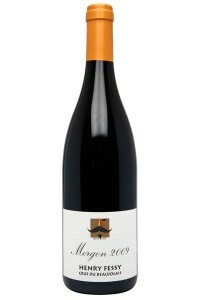 The first bottle is a rather wonderful Beaujolais – Morgon 2009 Henry Fessy. Miss Bouquet’s tasting notes tell me that it has ‘ripe summer berry fruits, vanilla pod and velvety tannins’ and is the perfect BBQ wine. Well, one look out of the window tells me that is not going to happen any time soon. Nor do I want to chill my reds to eat with food at this time of year. So what I was looking for was a dish I might normally serve with something fruity. As it happens I had some very special venison sausages in the fridge from The Cornish Game Company. And, I’d already decided that I needed to make a celeriac mash to go with them. Rather lighter than normal mash and lower in calories, it’s something I’ve been experimenting with to find a way of eating mash with my 5:2 meals. 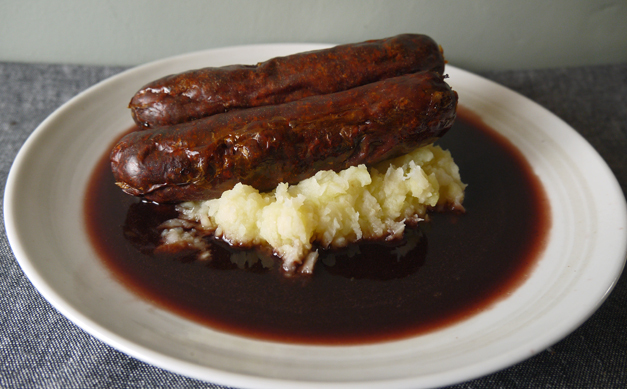 I wanted a nice fruity red wine gravy to go WITH the sausages, because…well, just because. But, as it was for a mid week supper I wasn’t looking for anything too heavy. So Sausage and Mash is what I made, albeit a rather posh version! Pre-heat the oven to 170c Prick the sausages all over and put in the sausages along with the banana shallot in a heavy based roasting tin. If the sausages have a low fat content (that will depend on whether you have pure venison or a mix of venison and pork), you may want to add a little cooking fat or oil to the pan. Simmer for 15-20 minutes till both vegetables are cooked but not disintegrating, drain and then put the lid back on the pan while you check the sausages. Add the cornflour to the roasting tin and use your fork to pull in any caramelised bits of meat. Now add the wine and heat gently on the hob to deglaze the pan, stirring all the time before stirring in the red onion jam if you are using it. Add the olive oil to the drained vegetables and mash thoroughly with a potato masher. Add in the creme fraiche with some extra butter if you want a richer mash. Did it work? Yes, though having polished off half the bottle I want to try the other half with some lamb as I think that may work rather well too. For me this wine works very well for meats that you might normally eat with a red fruit jelly (redcurrant or cranberry). I’m sure it works brilliantly with barbeques too, I’m just not planning on having one soon! It’s light and fruity but still has enough body to stand up to a well flavoured meat dish. And I do love the concept of the Oddbins case. After all, why have a case put together by just one wine expert when you can have six of them! And for those of you who like me are trying to follow the 5:2 diet, celeriac mash is a great concept. The version I’ve made here has about 100 calories per 150g serving because celeriac is half the calories of potato. If you don’t like that slight celery taste, you can do the same thing with cauliflower…but I’d advise cooking the cauliflower separately for just 10 minutes, so it doesn’t disintegrate by the time the potato is ready. Fantastic concept of having the experts pick the bottles! I order groceries through FreshDirect.com (I know, I know…silly New Yorkers), but they have an excellent option that similarly allows you to pick “reds” or “whites” and they’ll put together a box of their 6 best picks under $10…most that I’ve tried have been a huge hit, and it’s a nice way to get a bit of variation! it’s actually better than my rather dodgy photo looks! And don’t you just love the idea of getting wine writers to collectively pick a box! Oh, wow, Fiona! This looks and sounds amazing!I bet the wine will be perfect with the lamb, too. You’ll have to let us know.